It's the first time a complete series by the Spanish master has traveled to the U.S.
'Gather around, that I may tell you what will happen to you in days to come," Jacob tells his sons in Genesis. Gather around, I add, that I may tell you what will happen if you visit "Zurbarán: Jacob and His Twelve Sons, Paintings From Auckland Castle" at the Meadows Museum. You will be visually thrilled by these life-size paintings; see Francisco de Zurbarán (1598-1664) in a new light; discover his inspirations for this series; grasp much about his working methods; witness the toll of time on paint; recall a biblical story important to the Abrahamic religions; and learn the intriguing backstory of this cycle and why it (indeed, any series by Zurbarán, who made several) has come to the U.S. for the first time. These paintings date to the 1640s— near the end of the Spanish Golden Age—but they are unlike most Zurbarán works. They are naturalistic, but not as mystical, sculptural or intense. His palette here is more colorful; his lighting less dramatic. They feature not Christ, saints or monks, but Old Testament figures. And their commissioner is unknown, not an ecclesiastical patron; some speculate that they may have been intended for export to the New World. They all disappeared until the 1720s, when they turn up in London, owned by a Jewish merchant. In 1756, Richard Trevor, the prince-bishop of Durham in northern England, won all but two of the 13 at auction (Joseph, which he soon purchased privately, and Benjamin, which would pass into the collection at Grimsthorpe Castle in Lincolnshire). Trevor hung them, along with a copy he commissioned of Benjamin, in Auckland Castle's dining room. At the time, neither Catholics nor Jews had full civil rights in England. Trevor had argued on behalf of Jews in Parliament and, by displaying art featuring the ancient tribes of Israel produced in Catholic Spain, he made a statement about religious tolerance to his powerful dinner guests. There the paintings remained for more than 250 years (except for an exhibit in London and Madrid in 1994-95). In 2012, the commissioners of the Church of England sold them and the castle to British investor and collector Jonathan Ruffer, who grew up in once thriving, but now depressed northern England. Mr. Ruffer is restoring the castle and developing a museum of faith there—thus creating the opportunity for this exhibition. In the main gallery, Zurbarán's series looks glorious against green wallpaper that replicates Trevor's. Jacob, grandson of Abraham, and bent with age, leans on a cane. Arrayed around him are his sons. Each one dominates a bucolic landscape. Each one is uniquely dressed, shod and posed. Each one communicates the "blessing" Jacob conferred to him on his deathbed. Yet with all their disparate personalities, they form a cohesive whole. Judah—king and father of kings—faces the viewer regally, wearing a crown and an elaborately brocaded, fur-collared coat and holding a star-topped scepter. 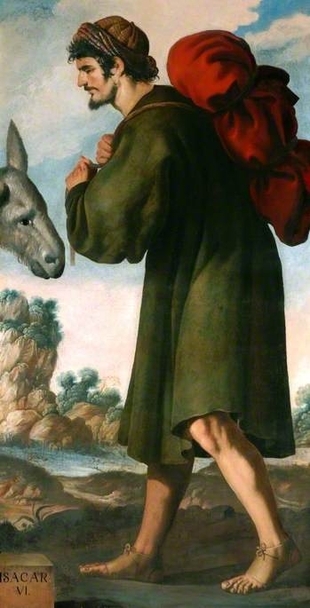 Issachar—"a strong donkey," in Jacob's words—walks in profile, very simply dressed and bearing a burden on his back, his donkey in tow. Zebulun—a sailor—holds an anchor and barge pole and wears striped, cropped pants that indicate his success. The most stunning is Asher—whose "food shall be rich." He is a ruddy-cheeked farmer, in profile, nonetheless dressed in richly patterned, brilliantly colored garb. Set in a wheat field, he carries a basket of bread, perhaps subtle reference to Jesus in the Holy Eucharist. The others once were likely as vivid. Benjamin, in the 18th-century copy, also on display here, wears rose trousers, decorated with yellow bows, that have faded unevenly in the original. His handsome, half-shaded face is grayish in the original, not fleshy pink as in the copy. And Joseph—he of the coat of many colors—is cloaked now in tan and gray. Once, it was lavender and his black leggings were emerald green. Visitors will learn this because the paintings actually left England a year ago, shipped to the conservation labs of the nearby Kimbell Art Museum. There, technical analysis revealed the paint loss and much about Zurbarán's working methods. There are few examples of pentimenti, for instance, an indication that the works were well planned before being executed by Zurbarán and his workshop. On the other hand, there are some "late-stage edits," according to conservator Claire Barry. 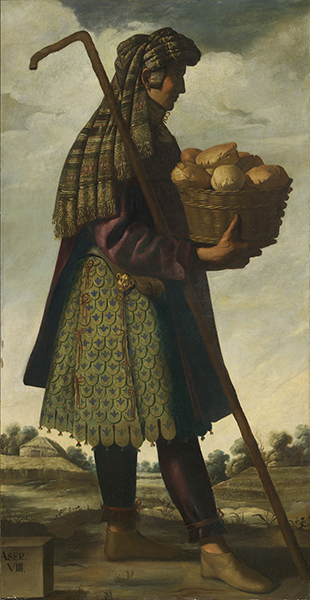 Zurbarán added more bread to Asher's basket, for example, and he filled out Zebulun's face, which had been thinner, gaunter, a bit like Issachar's. Scholars knew that Zurbarán looked to prints by other artists for gestures, costume elements and other inspirations. The new research shows more connections, adding "The Twelve Apostles" by Martin Schongauer (c. 1445-1491) to works by Dürer, Jacques de Gheyn II and Philip Galle. Many of those prints and engravings, as well as the analytical discoveries, are on view in side galleries here. They greatly enrich the visitor experience and make "Zurbarán: Jacob and His Twelve Sons" a many-splendored thing. See more photos of the paintings on the Wall Street Journal site or at the Meadows website, which is hot-linked in the article.